I've mentioned on my blog before about my love of Applegate Farms Southwestern Chicken. Well in an effort to recreate it for all my vegetarian friends I thought I would come up with a Southwestern inspired dish, still packed with protein. In a saucepan bring the dry quinoa and vegetable broth to a boil. Once it begins to boil, set your heat to low, cover and cook about 20 minutes until all of the liquid is absorbed. 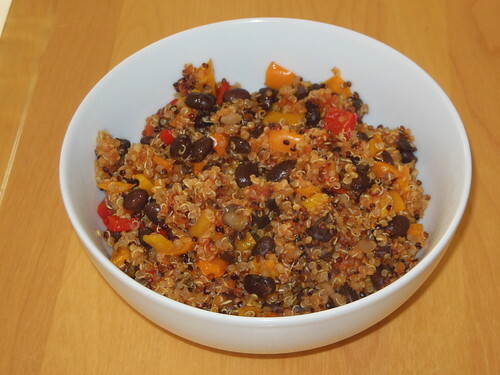 While the quinoa is cooking, dice your bell peppers and saute them in a skillet over medium-low heat until tender. 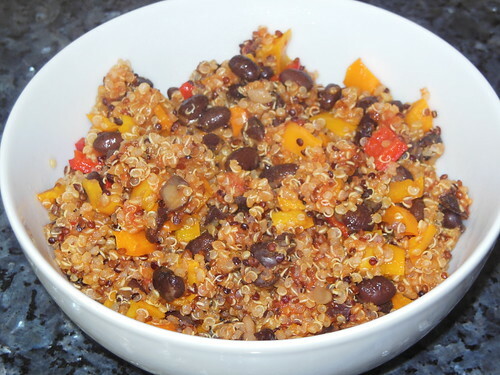 Once the quinoa has cooked fluff with a fork and return to the low heat. Add in the diced tomatoes, cooked peppers, and rinsed black beans, mix together and simmer over low heat. Add in your seasonings and let simmer until warm and ready to serve. What's your favorite vegetarian recipe?